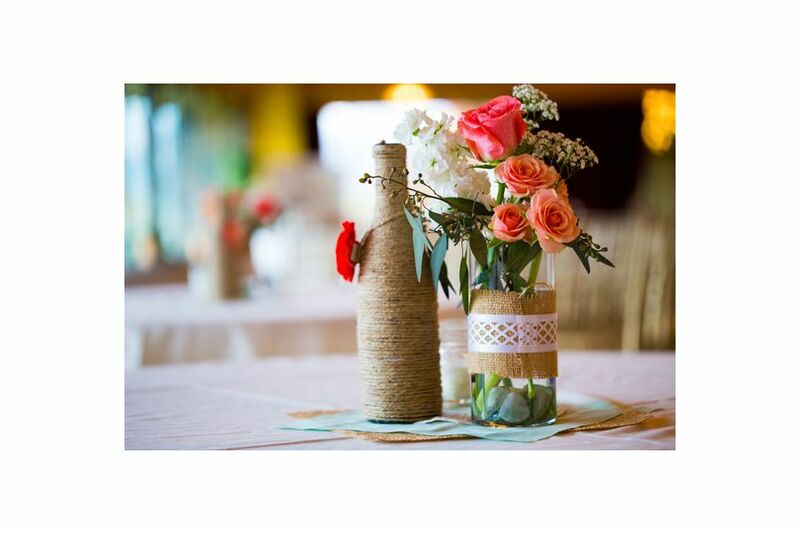 Centerpieces don’t have to just look nice – they can have a dual purpose. “Long gone are the days when brides and grooms are willing to spend money on flowers that will get thrown away at the end of the night,” says Maggie Rodriguez, founder of Inspired Events in Miami. Today’s couples are repurposing centerpieces as snacks, desserts or favors. One solution: use small plants to make a larger table statement. Guests can take the plants with them as they leave, making the centerpiece vibrant and changing throughout the evening. Hydrangeas are currently a popular centerpiece flower, says Jennifir Huston, floral designer at Triangle Catering in Raleigh. It doesn’t take many to create a full look, and they also mix well with other powerhouse flowers like roses and orchids. Don’t just focus on the flowers. The vessel you put them in is a key part of the centerpiece’s overall look, says Rodriguez. Different colored geometric or Depression glass containers create a dynamic aesthetic. Use different styles and colors of containers at different tables to create an element of surprise. “There’s nothing that can really clash anymore,” says Rodriguez. Mixing it up can also extend to the height of a centerpiece. Put taller centerpieces on some tables and shorter ones on the others. “It adds interest and depth to a room,” says Huston. Precious stones are hot right now, says Rodriguez, particularly emeralds, sapphires and stones in the raw. Stone-focused centerpieces give an earthy and natural vibe to your celebration. For a rustic wedding, fill ornate golden urns with succulents. Combining textures and elements brings out the chic in a casual look. A centerpiece doesn’t have to be on the table – it can hang above and come close to the table. Rodriguez says a formal wedding can instill that wow factor by hanging chandeliers over each table. Formal weddings always look brighter with candles. Take this effect to new heights with candelabra centerpieces. They can be just the right way to add an extra pop of elegance to your tables. Guests all know the bride and groom, but they don’t always know each other. Bring everyone together by creating icebreaker centerpieces. Stack boxes of trivia cards and games guests can play between courses or dances. World travelers can share their adventures by framing pictures of their favorite places in frames for each table. Keep up the travel theme by adding globes or maps. Use nature in surprising ways. Artfully arrange tree branches, rocks and stones to create a naturescape at each table. You can also use garland to add a green look to an entire venue. Wind it around columns or fireplaces. On tables, use it as a table runner for a simple, chic look. Pots of herbs can be a great way to showcase a foodie-inspired wedding. For a cooking-themed wedding, Huston crafted beautiful pieces by lining cylinder vases with moss, filling them with soil and adding an herb plant like basil or cilantro. At the end of the evening, guests could take home the plants and use the herbs in their own cooking.